One of the great things about the Eurogamer Expo is its strong focus on indie games -- a side-effect of the expo's location in the UK, which plays host to one of the most active indie developer communities there is. Tucked away near the Pizza Express in one corner of the exhibition hall is the Indie Arcade, an unassuming little Sega-sponsored booth in which a number of developers from around the world -- including Witch Beam Games, whose excellent blaster Assault Android Cactus we looked at yesterday -- showcase their latest work. There's a diverse array of interactive entertainment on offer here, including some highly creative games that are the perfect counter to franchise fatigue. One such title is Chroma, the work of Manchester-based developer Mark Foster. It's a pixel-art puzzle platformer -- something of a saturated genre in the indie space, yes, but Chroma's an intriguing little adventure that's more than worthy of a closer look. Chroma's core concept is the exploration of duality -- light and dark, yin and yang, two parts of one whole working together to overcome challenges. This idea is personified in the main character, a stylized little non-gender-specific pixel art person who, shortly after the beginning of the game, comes into possession of a power that allows them the ability to separate their shadow from their main body, which emits light. The journey to obtain this power is an interesting one. You begin in a forest, with a floating, glowing... thing beside you. Completely without words -- Foster is adamant that the game will be completely without words if at all possible -- it urges you to follow it into the depths of the forest and down into a cave. Rather than acting as a floating waypoint, the glowing fragment acts in a realistic, believable manner -- surging ahead, then waiting for the player to follow it, leading the way into the darkness. Upon actually reaching the point where the character attains their power, control is only taken away for a few moments at most -- Foster is similarly adamant that he wants to keep cutscenes to a minimum -- before the game proper begins. Chroma is an exploration-based game that gives you no prompts whatsoever -- you have to determine exactly what your objective is yourself, along with how best to use the core character-swapping mechanic. Essentially, the main gameplay loop involves using the light-emitting main body to cast shadows around the environment, then using the dark shadow character to run along the shadows and get to otherwise inaccessible areas, at which point it can "summon" the main body to its current location. Much of the game's challenge comes from determining how best to use the objects in a room to cast advantageous shadows -- or how to safely descend a deep pit, since both characters will shatter if they fall for too great a distance. The game's minimalist, monochrome look in its early stages makes the few uses of color really stand out. 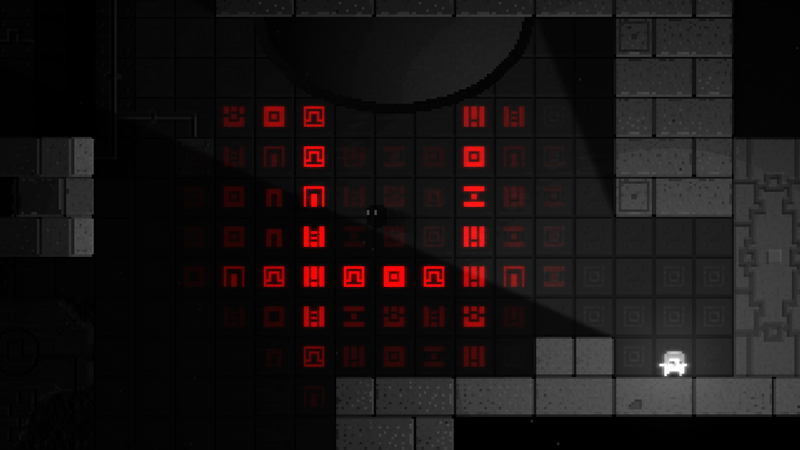 The game has a somewhat minimalist aesthetic, beginning in monochrome, with small splashes of color being added over time. Sound is similarly minimal -- there's no music, though there is ambient background sound, plus most things in the world make some sort of noise, allowing for the creation of an improvised soundtrack through play. This can even have something of a music-like quality, since the character swapping between their two forms causes them to emit a random synthesized musical note. An important part of the game is the idea of discovery -- everything from how the map is laid out to exactly what you're supposed to be doing. Over time, you'll start to discover that all is not as it initially appears in this world -- there are some things scrawled on the walls that can only be seen when shadow is cast upon them, for example, and the whole demo on show here at EGX ended with the shadowy character revealing a mysterious, colorful map that seemed to indicate a long-term objective. There's a palpable sense of melancholy to the game world -- Foster himself notes that the game is a "grim place, born from rough times and sad thoughts" so it's clearly a very personal project and valuable means of self-expression to him. At the same time, as negative as the thoughts that gave birth to the concept might have been, it's making for what already seems to be a high-quality game sure to be of interest to those who enjoy minimalist storytelling and freeform exploration with little to no handholding. Chroma is still in development for PC, Mac and possibly Linux, and there doesn't seem to be a firm release date as yet. Keep an eye on Foster's site and Twitter for the latest on development. Tagged with chroma,	egx,	eurogamerexpo,	iamclaw,	linux,	Macs,	markfoster,	PC,	Previews.